For someone who had a whole theory about why he wouldn’t buy one, I am very surprised how long I lasted before getting my iPhone. Yes, I finally have one and it is, all in all, and amazing combination of technology and user experience design. Living about one hour north of the US border, I drove down to a small town in upstate New York last weekend to get my iPhone and activated it as a pay-as-you-go cell phone from a Starbucks (you know, the other Apple partner when it comes to this device) and updated it to the 1.1.1 firmware. As soon as I crossed the border back, I took the SIM card out so that the battery would not drain to quickly, especially as AT&T dosen’t offer international roaming on their GoPhone plans. Oh yes, Apple, I know I removed the SIM card… no need to remind me about that on a regular basis with a modal dialog box. Time to get a new completely unfounded rumor out of thin air: Apple is expected to announce the first four third-party applications as well as the SDK for the iPhone at the upcoming World Wide Developer Conference in San Fransisco, California. All these applications will not only be available for iPhone users, but will also be compatible with the iPod touch. And to make it the best user experience, all these applications will be available directly from the iTunes store for as little as $9.99. For the third-party developers: think about the game consoles model. I’ve been using a WiFi Skype phone for a while. While the form facor was great, the sound quality wasn’t perfect and I was missing the chat capability, which is one of my main usages of Skype. As the industry specialized in toys for geeks cannot stand still for very long, I knew it wouldn’t have to wait for an extended period until a replacement device would come out… I just didn’t expect it to be from Sony. I got myself a Mylo about two weeks ago. It’s a wired little piece of WiFi electronics that is targeted at the IM generation. 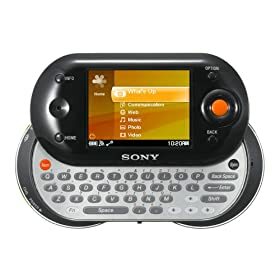 The Sony Mylo is a device that is just slightly larger and thicker than an average modern cell phone, with a color screen, an 802.11b network connection and a sliding keyboard made for one thing: communicating through instant messaging and VoIP. number of emails per hour = the new productivity measure? In a modern business environment, email is everywhere. When using Lotus Notes or Microsoft Exchange / Outlook solutions, it is even the underlying technology for collaborative scheduling, tasks management and notes taking! And with emails being the “killer-app” for the mobile communication, from Blackberry to Palm Treo devices… it sometimes feel like your number one “productivity application” is your email client, with the word processor becoming the underlying technology for writing electronic documents sent over the Internet. Could this mean that the number of emails per hours (eMpH) one is able to process is the new way to measure productivity? Continue reading number of emails per hour = the new productivity measure? Posted on Thursday, March 1, 2007 Sunday, March 11, 2007 Categories softwareTags email, opinion, productivity1 Comment on number of emails per hour = the new productivity measure? Why is Blu-Ray going to fail? The reason is simple: I got a Blu-Ray and not an HD-DVD player, and I always have the impression that the technology I go for will be the one that won’t be the standard a few years later… but right now, all indications are going into the other way. While HD-DVD had an initial “first-to-market” advantage, Sony’s decision to include a Blu-Ray player in the Playstation 3 has dramatically shifted the game and enabled this format to overtake the former within a few weeks. As for any new technology introduced, being the choice of the early adopters and the market leader while adoption hasn’t reached the mainstream users is in no way a guarantee for success. Offering the best or most advanced feature set is also a no indication of becoming the long term leader. We’ve seen this over and over again, from Apple Macintosh to the Palm. Being backed by Microsoft can help in the long term, but the iPod / iTunes offering is (so far) a proof of the opposite. Continue reading Why is Blu-Ray going to fail? Posted on Thursday, February 15, 2007 Thursday, February 15, 2007 Categories hardwareTags blu-ray, hardware, opinion, playstation 32 Comments on Why is Blu-Ray going to fail?